Luminesence is the newest addition to Gloriana’s lovely line of threads. It’s a fine mostly matte silk that is single-stranded with three plies per strand. It cannot be divided. One strand is equal to about two strands of floss. Dyed to match many of the colors of other Gloriana silks, it comes in 40 yard twist skeins. A selection of the colors is pictured above. The most unique feature of this thread is its texture which is almost matte. You can now get several textures in these silks, all in matching colors. Luminesence is the most matte. Duchess Silk, which is much thicker, is slightly more shiny. Silk Floss is in the middle, with a subtle shine; several of the other silks have this texture as well. The two sizes of Princess Perle are very shiny. This means that you can use texture as a way to shade without changing colors because shiny textures move forward and matte textures recede. If you were stitching a flower with drops of water on it, you could stitch most of the flower in silk floss. The shadows would be stitched with Luminesence, and the petals under the drops in Princess Perle. The result would be subtle but very realistic. I recently used this thread to stitch my Charlie Harper crab ornament, which was on 18 mesh. I stitched two different textured stitches as well as Tent on it, using two strands. I liked the look of the stitches, but the thread was slightly harder than average to use. It tends to pull unevenly when you use multiple strands. This results in strands sticking out. Not only can these strands snag more easily, they look messy. On my project I solved the problem by pulling the strand on the back and securing it with thread or by catching the errant strand as I went into a dirty hole. Another challenge with this thread is cutting stitching lengths. It will be difficult to cut the skein and keep it on the card. To keep my thread neat I put it into Floss-a-way bags as soon as the skeins were cut. 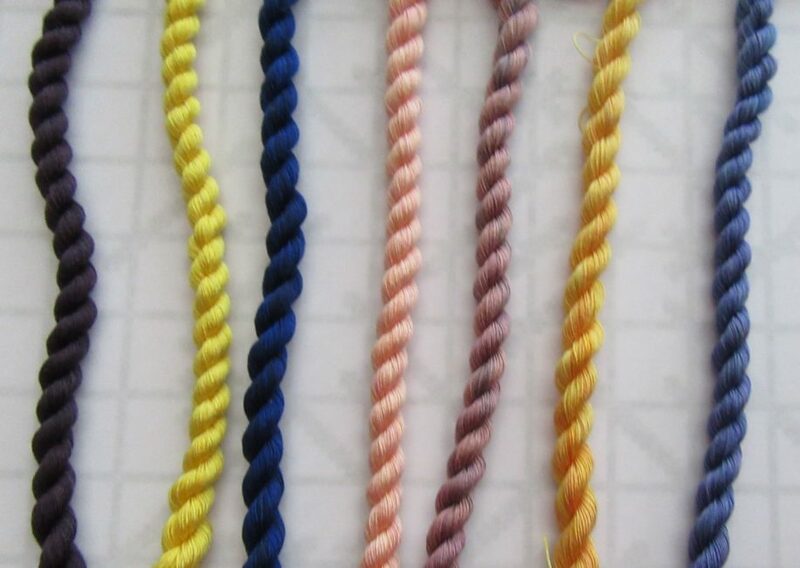 To cut stitching lengths, gently untwist the skein and separate the sides so you can see the knot at the bottom. Cut the knot between the two ends of the skein. This will allow the skein to untwist and come off the card. Find one end of the skein and separate the sides. Cut through the skein at the very top of one end. You will have lengths about 20″ long. Although the thread inside the bags looked messy as I used it, I had no problem getting stitching lengths out. This thread is a lovely addition to Gloriana.